While current motor racing fans are used to watching Formula 1 Grands Prix take place in South America at the end of the racing season, it was not so long ago that these events occupied early slots on the calendar, rather than later ones. The 2004 Brazilian Grand Prix, for example, was the first time the country had held a World Championship race that was not one of the opening three events of the season. It was partnered, intermittently, by another stop in the region – in Argentina. All 21 World Championship Argentine Grands Prix were held at the then-named Autódromo 17 de Octubre, which would later be known as the Autódromo de Buenos Aires Juan y Oscar Gálvez, after the racing brothers. The opening round of the 1953 Formula 1 World Championship season (then known as the 1953 World Championship of Drivers), was held at the recently completed race track on the outskirts of Buenos Aires – the first F1 race held on the continent. Taking place in hot conditions on 18th January, the race was free to spectators who packed the 2.4-mile circuit – some estimates state a crowd of over 400,000. The early start to the year was a burden for race teams who were fighting with shortening ‘off-seasons’, particularly the independent entrants who were playing catch-up with the dominant Ferrari of that period. With cars being freighted to the race via sea transport, development of new cars was limited. Formula 1 racing at the time was run to Formula Two regulations, after the withdrawal in 1952 of several racing teams. The Ferrari 500 was the car to beat, as was World Champion Alberto Ascari, who was to win the seventh of what would be a record nine-straight F1 race wins, en route to back-to-back titles. Ascari was backed up by an all-star line-up of Guiseppe Farina, Mike Hawthorn, and Luigi Villoresi for the season. Ferrari would take eight of the nine race victories – Juan Manuel Fangio spoiling the perfect season at Monza to end the year – and a host of non-Championship races including the International Trophy at Silverstone and Pau Grand Prix. 16 cars entered the 97-lap race in Argentina, with Ascari narrowly pipping local hero Fangio to pole position. 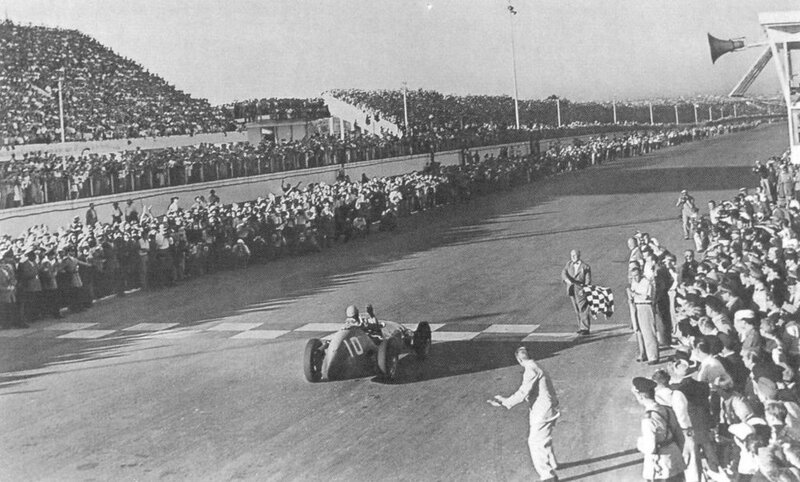 In the end, Ascari simply had too much for anyone else, and drove to a one-lap victory over Villoresi, with another Argentine, Jose Froilan Gonzalez, in third. Sadly the overcrowding of the circuit was a contributing factor to a tragic accident on lap 31. Excitable spectators who did not have seats in the grandstands lining the circuit encroached ever-closer to the track to see the action, with the main straight lined by hordes of fans who bypassed broken security fences. As Farina lost control swerving to avoid a fan who wandered onto the track, 13 individuals lost their lives. Ascari takes the chequered flag. Photo: unknown. 19 years later, Argentina once again hosted the opening round of the season, this time on 23rd January. The circuit had not hosted a World Championship round since 1960, though did host a non-Championship round a year previous. This time out some 22 cars entered the event, with teams bringing a mixture of trusted models from ’71 and updated cars for the new season. Practise sessions were held over four hours on both Friday and Saturday, the latter of which was run in front of a large and enthusiastic crowd cheering on countryman Carlos Reutemann. They would not be disappointed, as he duly put the car on pole in his first World Championship Grand Prix. Jackie Stewart leads Carlos Reutetmann. Photo: unknown. In front of some 100,000 fans Reutemann battled Jackie Stewart for the lead, with the Scotsman jumping ahead at the start but unable to shake off the Brabham behind. He would be aided when Reutemann’s tyres faded and held a comfortable lead over Denny Hulme and Emerson Fittipaldi. Stewart came home the winner ahead of Hulme, with Jacky Ickx third. Reutemann eventually had to pit for fresh tyres, and finished seventh, following home the experienced race-winner in the final laps. With a brief respite in 1976, Argentina held a World Championship round from 1972 to 1981. After the drivers’ strike in South Africa in ’82, the organisers cancelled the event, and political ramifications kept the race off the calendar for the foreseeable future. 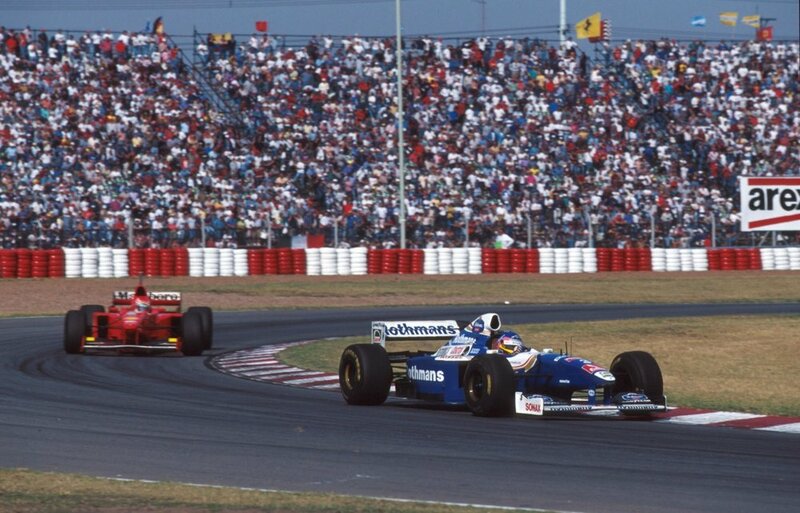 Formula 1 did return to Buenos Aires in 1995, but the tight and twisty track used (the races were run on the No. 6 layout, rather than the longer No. 15 configuration) did not make for exciting racing, and financial problems meant the event was not held after 1998. Jacques Villeneuve at the 1997 Argentine Grand Prix. Photo: Sutton. There have been rumours of a return to the country, on either a brand-new track or a street circuit, but for now the race is consigned to the history books. Whatever happens, it is unlikely, with the Brazilian Grand Prix now held at the end of the season, that Argentina would host an early round as it once did and is even more unlikely that race fans will ever watch a January Grand Prix again.